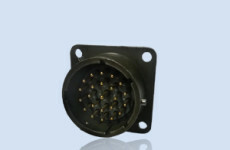 Connector code 1E2A910G 10 poles, miniaturized male panel mount connector, model JMR1610M (size 16 – IP67 – conforms to JIS-C-5432, UL approved) for incremental encoder or other custom applications. Fixed MIL male connector 23 poles. Panel Mount.